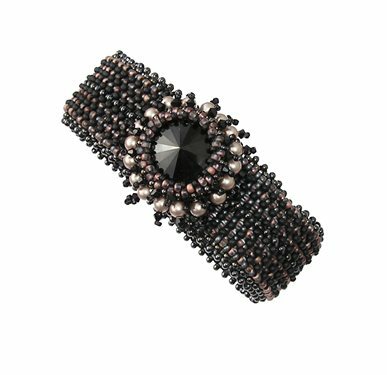 Made with metal seed beads based off the Shelley Nybakke cuff Metalsmith Match. I put the Toho Hybrid #851Y into the second layer and added a bezeled Rivoli slide clasp. . . I really like this piece. If you've not tried metal seed beads yet, they are extremely uniform and lock together. If you like Toho for their uniformity, you'll like metal for the same reason.